What you want does already exist. It's app/smartphone/tablet ready plug and play. I have plugged into my multi-plexer, which are 0183 wired to my Simrad CP, and my Raynav CP. I can up/dn load to either unit. Run my wifi laptop/tablet/smart phone. There's always something to learn A RasPi will probably get you as close to your 100mA goal (don't have one to measure) as possible, but it's not powerful enough to be seriously used as a nav station. It's something I'll consider, tough I'm still averse to the idea of using a whole computer for something that only needs something much simpler. Apart from anything else it adds complications such as startup time to a device which might as well be instant-on. You could get even simpler (but not cheaper) with something like an Arduino with ethernet shield, it will be reasonably simple to write something mirroring serial input to net exactly the way you like it, if you know some C.
I'd love to use an Arduino for this... but as you hint at, they've always seemed to me a bit expensive for what they are. That said, I guess it's the obvious way to create what I want. This board would be a more cost-effective way of doing it than an Arduino with an ethernet shield, I guess. I'm not familiar with the Arduino, but I've always liked the idea of playing with one. I'm not good enough with C to make it "easy" (nor with Arduino's "Wiring"/"Processing" environment), nor am I familiar with the protocols I'm looking to handle, but that just makes it more interesting and more worthwhile. Now we're talking. I think. But what does this device actually do? How do I access the NMEA data over the ethernet? Presumably it would involve some kind of drivers on the computer side to create a virtual COM port? I'm not familiar enough with either serial interfaces or networking to know what's possible. If you want to experience some ARM adventure, mk802 v2 is the device you want to have a look at - has more power than the Pi and costs way less than a Beagle or Pandaboard. Now that does look interesting, but so far as I can see it only has drivers for Windows. So how do you use it from your tablet and smartphone? Presumably by some other method than a virtual COM port? How do navigational apps on the tablet/smartphone access the NMEA data? Hey this stuff is pretty similar to AppleTalk. What is pretty similar? And hang on, AppleTalk was abandoned about 10 years ago... it's modern equivalent is Bonjour/Zeroconf, but I'm not sure how that set of protocols would help me do any of what I want to do here. Please elucidate. I use a very similar device to the one already mentioned. Made by Moxa, but connected by wired ethernet first since my primary Nav computers are all wired. The data is available though via WiFi though since everything is on the same network. There is also some good discussion below the blog post there. I use the Standard Horizon radio, and since my Cradlepoint router died, I'm now using the TP Link MR3420. I've also added a Bullet 2 HP connected to the WAN port for when 3G is not available and a WiFi connection is. The Moxa only does one mode at a time, but does support multiple connections simultaneously. With Coastal Explorer I could use TCP server mode. But when I switched to MaxSea for different charts, and at the time, it required serial device emulation which I'm using today. This mode pretty much leaves out IOS or Android devices...I think. Many programs will connect to a TCP/IP or UDP NMEA stream, without the need to convert it to a virtual serial port. Check the programs you want to use and see if they can connect to a network server. Shipmodul makes a NMEA multiplexer with a built-in WiFi server, that might do the job for you, but a single serial/WiFi device may do what you need. The Shipmodul mux, and some other serial/WiFi units only provide one server connection. It looks like the VSCOM unit allows multiple network connections. The VSCOM unit does have significant power consumption. Will you want to have multiple WiFi connections to the NMEA data? DC 9-30 volt 200-600 mA at 12 volts native. So depending on load, ie how many devises running. And porting from a multiplexer, then the data stream is refined and buffered. It looks like the VSCOM unit allows multiple network connections. The VSCOM unit does have significant power consumption. I have been working on this very problem. Ive just put up a working version of 'Freeboard', which uses cheap commodity hardware to provide nav data to anything with a web browser (any browser except IE, which is way behind in HTML5 and websockets). 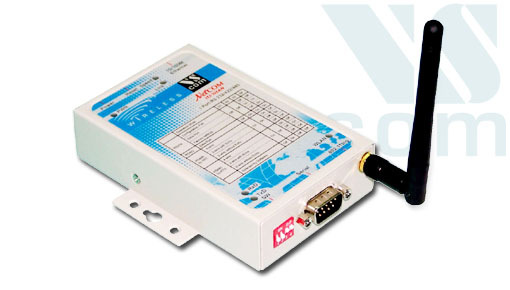 FCC Class A, CE Class A, RoHS, IEEE 802.11b/g, RS232, RS422, or RS485. This is no backyard cook-up. I paid twice that just for the multi-plexer...so that My 2 Cp's, DS, DSC, and VHF could all talk and listen, so an extra $200 to let all the, pad/smart-phones/laptops also listen in seems cheap. Not to mention that now I can up/Dn load to either CP from any laptop I choose. Thanks, that's a very interesting article. I hadn't realised there was a potential issue with the radio following the RS232 standard instead of RS422. I'm only just getting into all this; I'd previously thought NMEA0183 was pretty simple and just a case of connecting all the NMEA wires together from the different instruments! Exactly the setup I'm planning when I get back to the boat with my newly bough kit next week. Now, I have another question partly related to this. I'm starting to understand a little more about NMEA0183 and I now see that it's not as simple as I'd previously thought. So what I want to know, is do I need a multiplexer? My only two NMEA talkers are the VHF/AIS and the GPS. Now, both of these are in fact listeners as well. The VHF/AIS obviously wants the GPS position. The VHF isn't going to produce any info the GPS wants to listen to; the GPS listens for things like depth and boat speed which I don't have (or rather I don't have devices with NMEA outputs). So, with these two devices it would be a simple matter of connecting the NMEA output of one to the NMEA input of the other, and vice-versa. I assume. But now I want the computer to listen to the outputs of those devices. So how does that work? As I now understand it, this isn't possible without a multiplexer. Is that right? Now, if I want to "listen" to that on the computer, what do I do? In particular, if I want to listen to both that and the GPS data (obviously NMEA at 4800 baud), what do I do? The question really is, do I need a special NMEA multiplexer with ethernet/wifi functionality for this, or will a normal serial-ethernet device do it? Will you want to have multiple WiFi connections to the NMEA data? Realistically, probably not. But I like the idea of having the ability to do so. I do not have a multiplexer. You don't really need one if you have a enough serial ports on your Ethernet gateway. All the software I've seen allows you to define many NMEA inputs and outputs. But depending on what you want to do, most of the multiplexers have RS422/NMEA ports for sources, and provide a RS232 port for a PC....or a single Ethernet gateway, potentially reducing the network interface to a single serial port. In your case, you need either a mux..or...at least 2 serial ports on your Ethernet server like I have. One for NMEA HS AIS and one for NMEA GPS data. The GPS input to the radio is one of perhaps many listeners, in your case at least gateway and radio. In my case, the single GPS feeds my chartplotter, autopilot, stabilizers, Standard Radio and Ethernet gateway. Hope at least some of that helps. What is your Nav program going to be? ShipModul Marine Electronics Yes it's more, (350) but it's a multiplexor AND wifi bridge. Less power, less cost than buying both. Is only $185. And for most people gets enough data on the network. This has 2 RS422 ports, but there is a similar version with one RS232 and one RS422 port. If the Horizon AIS feed is still RS232, this would be the choice for the OP. I don't want multiple WiFi networks on the ship...one for data combined with Internet when available. Don't think an Ipad or PC can connect to two WiFi nets at the same time. I think a wifi router is a better solution. I also like wired connections for my critical Nav functions which are 2 PCs since I have 2 helm stations. Even the TP Link MR3420 router is only about 50 bucks now...and it can solve the ships WiFi access and Internet via 3G USB modem or WAN Ethernet port to a Bullet 2 HP (or your choice of WiFi extender). Total cost under $250, much less than a mux/single port Ethernet gateway....if 2 ports is enough. My issue was that I have multiple talkers, 6 in total, the mux can listen to up to 8 talkers. It combines everything into one out-put stream, then sends that out, in complete sentences. The VScom wifi defaults to its rj45 network port, which can then be hard wired into the ships wifi router, but if it doesn't sense a connection on that port it falls over to it's own wifi broadcast.